Pressing plant uncredited, identified with matrix numbers. 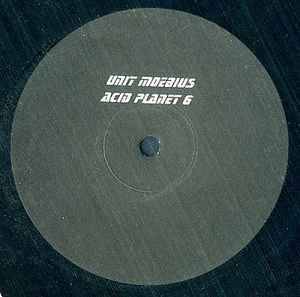 Unit Moebius are revisiting two Chicago house classics with this release.The sample "world turns round..." was used/created by the mysterious Cool McCool on the Acid LP (1988).The original "perculator" track was written by Cajmere (Green Velvet) and released in 1992..
One of the most important acid records ever made in my opinion...Verrrry Unit Moebius. Contains spacetrip tracks like "the world goes round" (wonk-squeeeek) but also thumping techno-acid like 'beat that perculator' (woop-woop-weep-weep) and weird skip-and-jump pure acid pounders. Lotts of freaky voices, 808, 303, ms20, delays and reverb.